We provide solutions for small businesses without an IT department. reactive and is delivered on-site as well as remotely. 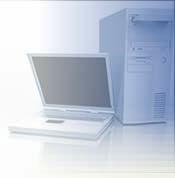 Our goal is to keep our clients' computers and networks operational at all times. Our Remote Support Plans are perfect for the support of a 1-10 business or home office computers with high-speed internet access. When you join this plan and install our remote software, you'll be able to count on us for fast remote assistance where we can bring a qualified technician right to your computer, over the Internet and have them assist you remotely. Our remote service uses our own local tech experts who you know and trust. For added security, we only connect as needed when you initiate a secure remote control session. This plan is billed monthly and you can cancel at any time.